Last month I was in Penang, Malaysia. I took my sketchbook and sketched outside what I saw. This week I decide to try reaching the next level. Instead of reproducing the reality, I want to be able to create my own environment. I start to gather some inspiration digging pictures from my different trips. 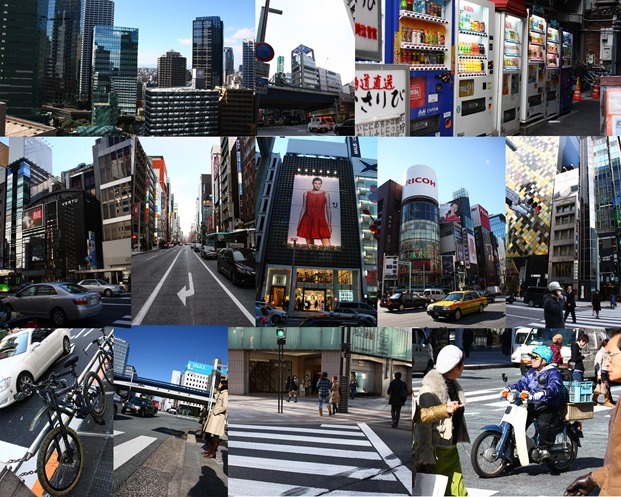 Above, some pictures from Tokyo, Japan. I look at all the interesting elements I would like to play with. Then I will mix the references! 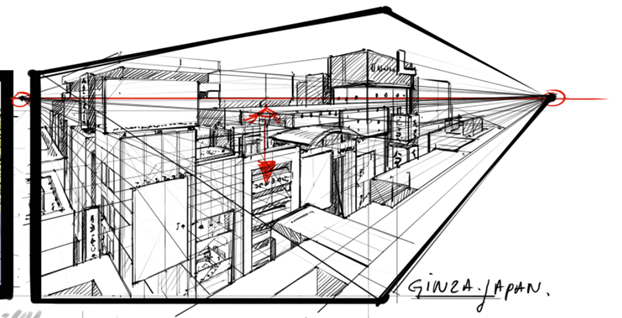 The technical challenge I give to myself is to play with different point of view such as sky view, mouse view. Perspective lines are kind of boring to set up at start. However, skipping them is not a smart move. 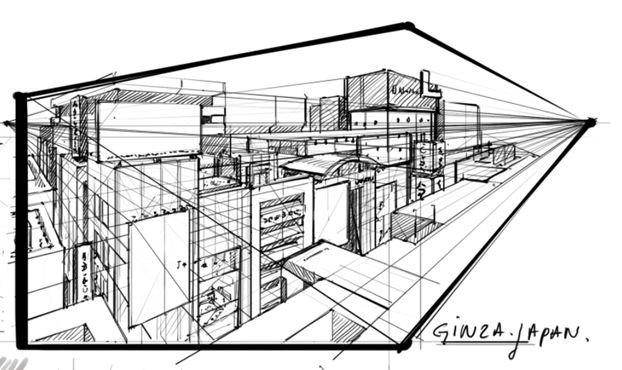 By just spending 2 minutes at setting the perspective lines, your sketch gain so much in accuracy. 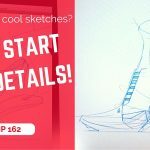 Plus, you will draw easier and faster. Starting with them simplify so much your sketching process that it become almost easy. I am standing on the top of one of these building! Remember that the horizon line is your eye level. In that situation, the line is very high being at the top of the thumbnail. I am looking down to admire the city view. 2. From the window of a medium size buildings. The buildings are lower, we can see the main street. People are represented with tiny dots. Basically the horizon line is similar to the previous one. You can decide on how high you want the buildings to be. Note that the vanishing points don’t have to be inside the scene. 3. From a mouse point of view. Imagine that you are a mouse. The view of the city is very low, closed to the ground. The city looks much bigger and impressive. Knowing the fundamentals help you to reach results so much faster and gives you the freedom to create by yourself. 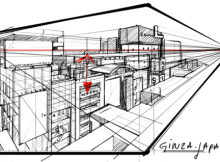 I warmly recommend you to use the perspective lines to set up your scene. Spend a couple of minutes to think about the scene you want, draw the lines and 50% of the job is done! 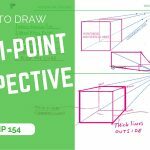 To get an introduction to perspective, feel free to subscribe to the newsletter. 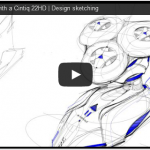 I will send you a free Ebook about how to start sketching. [theDesignerStarterKit]. (Let me know your email on the side bar). If this quick tutorial is helpful, or if you have any question, feel free to leave a comment ! Hello Hollman, have you sign up in the form already ? 🙂 If yes, please drop me an email at [email protected] and I will resend to you. The perspective lines are important, but how do you draw them without getting stuck between all the lines you already drew before you make the rest? If I do the perspective lines, my drawing always ends up just looking like a bunch of perspective lines in stead of whatever it should be. Hi Mirjam, do you mean that adding so many lines your vision end up kind of blurred? The trick is to use different level or pen pressure. Start drawing with a light one. Then bold the lines you are confident with. 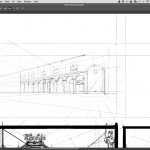 If you work on Photoshop, you can draw the lines in a separate layer and play with opacity. + when your sketch is finished, you can save it hiding all these lines.